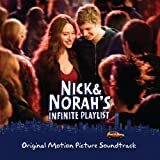 Nick & Norah's Infinite Playlist - DVD Review - Are You Screening? Nick & Norah‘s Infinite Playlist, despite the possible confusion this may raise in its main target demographic, is more a yarn than anything else. 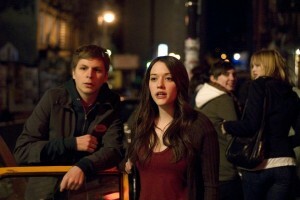 Michael Cera and Kat Dennings, frankly, are largely yarn players. It may sound odd initially, but to miss the idea is to lose the film altogether. Nick & Norah is the story of two misfitish characters, and their adventures on the fateful night when they stumble into each either. Nick has somewhat recently been dumped by Tris, and he’s still wrapped up in her. When he sets off with his almost-all-gay band for a night on the town, he soon meets up with Norah. Norah turns out to be Tris’ archnemesis (or vice versa), and the two spark a slight connection based on their common acquaintance. Norah also has a drunk friend in tow, and the night becomes a combination adventure wherein our heroes spend equal time searching for an elusive band called Where’s Fluffy? and said drunk friend who flies the coop. Tris keeps popping up to throw a wrench in things, and the evening is basically a New York club-hopping fiasco. It’s the sort of night you either tell your grandkids about, or lose to the obscurity of its similarity to every Saturday night of your life. That’s about all there is to say actually, except perhaps, “hilarity ensues,” because the little bits of play that transpire are not relevant so much as they are simply representative. As I say, this is a yarn, which is a step or two removed from a fable, but lives in the same neck of the woods. It is not that these things happen, but that these are the sorts of things that happen. It’s surprising to me that there aren’t more films today that go down a similar road, but that may only be because my generation seemed littered with them. Say Anything, as merely one iconic example, was a similar story. A movie that said, “it may have been different for our parents, or even for people ten years ago, but this is sort of what happens to us today.” We sit around the Gas N’ Sip, or go to odd “sit in” parties, and generally sort of find love by acting awkward at each other for a certain amount of time. Nick and Norah is in the same genre, it’s just that what this movie’s “we” do is bounce around clubs past four in the morning, cell people incessantly, wander aimlessly as almost a competitive sport, and find love by acting awkward at each other for a certain amount of time. Through the course of our wild night, Michael Cera and Kat Dennings (and most everyone else actually) deliver well as they give us characters who are in so many ways different in who they are, yet equal in uncertainty about who they are. The fun and funny trip through New York is littered with irritation and annoyance, but somehow at the end our heroes are thinking, “you know, that was a pretty good time.” And that too is only relevant in its representation. Both titles, and both films, take issue with two major errors that are cornerstones of our society’s view of love. One, that falling in love and meeting (in any serious sense of the word) are different things. And two, that they are things that stop happening. DVD Storage Tip: To save space in your home, buy a TV Stand with media storage for your DVDs and Blu-Ray discs. The Blu-Ray DVD is loaded with features, and is among the must buy Blu-Rays on the market. The features are honestly too numerous to cover sufficiently. 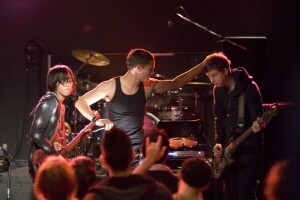 There are several outtakes and deleted scenes, as well as a storyboard gallery and digitial copy to get things started. There are also two commentary tracks, and both are pretty interesting. One is with Peter Sollett (director), authors Rachel Cohn and David Levithan and screenwriter Lorene Scafaria, and the other is with Peter Sollett, Michael Cera, Kat Dennings and Ari Graynor (Caroline – the drunk friend). The second commentary can also be played on Blu-Ray as a “telestrator” commentary using the famous picture-in-picture view. It’s quite worthy of a viewing. There are also photo galleries, a make your own playlist feature, interviews, and a feature that uses BD Live (if you can get that setup, which is annoying) to allow for a chat-enabled viewing where you can connect with others who share the same feature. My favorite is Kat Denning’s puppet show version of the movie, bear attacks included, which is at once unnervingly weird and pretty funny. It’s a wonderfully weird collection of special features that genuinely add a lot of value to the release.